We are often asked by new members, prospective new members and even by other genealogy societies about events and subject matter that we provide at our regular monthly meetings. Below is a list of activities for 2017. On December 4th, 190 members had the opportunity to view the "Introduction to DNA" webinar presented by Blaine Bettinger PhD, JD, the Genetic Genealogist. Blaine is going to be one of our speakers on the 2019 VGS genealogy cruise, so those who attended got a very good introduction to his informative presentations. We learned about Y-DNA, mtDNA and autosomal DNA in an easy to understand format. His handout contains many of the images that he use to illustrate the points he was making. The handout is available for download in the "Members Only" "Online Webinars" section of our website as is the actual video. The video will be available for viewing for three months. David McDonald gave an excellent informative presentation to the VGS Membership meeting on November 15. 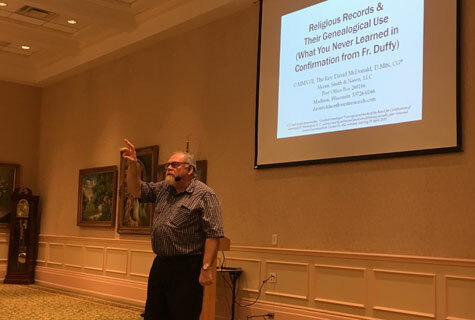 He spoke on the topic of “Religious Records and Their Genealogical Use”. He began with about a 45 minute presentation on the history of religions in the United States. This was very interesting, even for those of us who did not think it would be! He is very knowledgeable about this history and made it not only informative, but entertaining. This created a solid foundation on which he then explored the topic of religious records and their use. He then went into an exploration of the various religious documents. The standard “vital documents” generated by governing bodies and often used by genealogists as “building blocks” can only provide so much information. Many governing bodies did not keep vital records until the 19th or even early 20th centuries. Church records are important back up resources. They often provide records on births/baptisms, marriages, and deaths/burials. Understanding how the various religions thrived in the various parts of the United States provides an excellent resource as to where why people may have migrated, where records might be, and how to search for them. If you missed the presentation, the handout has been posted in "Members Only." At our October 23rd meeting about 175 members were in attendance along with another 75 members attending remotely via a live webinar. Our guest speaker was Amy Johnson Crow, CG and she presented "What Do You Mean There's No Record?! Using Vital Record Substitutes"
Amy stated: "In order to research and identify our ancestors, we must find records about them. Civil vital records are key components to genealogical research. What do you do when your ancestor was born in 1878 in Indiana (where civil birth records didn’t begin until 1882) or died in Ohio in 1862 (where civil death records didn’t begin until 1867)? It’s time to start thinking outside the box and look for other types of records – the vital records substitutes." If you missed the presentation, the handout and video have been posted in "Members Only." At our September 27th meeting 178 members were in attendance. Our guest speaker was Ann Staley, CGSM. CGLSM and she presented "Googling Your Family: Using the Whole Website." Ann gave an overview on how the site started in 1996, and demonstrated some tips on how to use their search engine. She also explained several other features provided by Google that many may not be aware of that could be useful in their genealogy research; such as Google Books, Google Images, Google Docs, News, Maps and Earth. What makes this site great is that it is all free. Do you have an Google account? Both handouts have been posted in "Members Only." 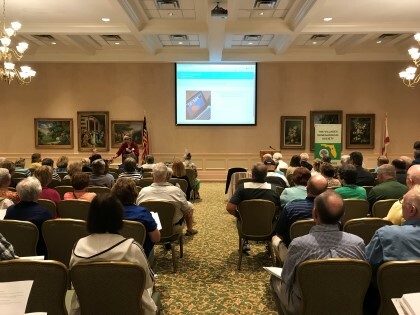 At our August 23rd meeting 115 members at the Savannah Center and another 77 at remote locations were able to watch our first live webinar presented by Mary Kircher Roddy. Her presentation was entitled “Family Browse. How to Find Unindexed Records in FamilySearch” We were a little nervous on how it would turn out but by all accounts it received very favorable comments. Here is one comment: Webinar was fantastic! Got lots of information on how to search that I was not aware of. We need to do more of these webinars. Thanks. Here is another... WONDERFUL! I've really never done a "live" webinar before. Today went so smoothly, and was SO informative, I must try these more often. I had no communication, nor volume problems, no break-ups in transmission! Thank you so much for all you do for the VGS, and for this most enlightening seminar!!!! Thank you to Mary! A copy of the handout and the link to view the entire webinar from "the cloud" has been sent to all members via email. We had another great turnout for our July summer meeting with about 115 members present. Welcome to two new members. This month we had two speakers. First was Dusty Matthews from the Leesburg Library. She spoke about the FamilySearch microfilms that they have at the library. She spoke about retention and ordering films before ordering is discontinued at the end of August. Next we had our very own Vice-President Annette Burke Lyttle and she presented "Chasing Uncle William through the Wilds of Cyberspace." It was a very informative and at times humorous account on her research on her Uncle William Crout. Handouts for both speakers are available in "Members Only> Secure Download's> Meeting Handouts"
We had a great turnout for our June meeting with about 115 members present plus we received 8 new member applications. Welcome! This month we had a panel of 4 experienced members who answered 12 questions that had been submitted by our membership. From the comments after the meeting, we will do this type of meeting again sometime in the future. Thank you to our panelists for taking the time to prepare answers to the member questions. Thank you also to our members who supplied the questions. Without your questions, this meeting would not have been a success. A copy of the PowerPoint slide presentation is in the "Members Only" section of our website. Dennis Michael Desmond was our guest speaker at our April meeting. You could tell that the snow-birds are heading north since only about 150 members were in attendance. Dennis presented "So, You Think You Want to Write a Book." Dennis went over the key aspects of a successful book. "Research, Writing & Publishing." Another key point is to have others read your book prior to publishing since you, the author, are to close to the story. You want to be sure others understand the subject matter being told. Genealogy Road Show co-host, Mary Tedesco, was out guest speaker for our March monthly meeting and the guest speaker in the afternoon for our Italian Special Interest Group meeting. 340 members heard Mary present "Underused Resources and Record Types for Genealogists" at the monthly meeeting and 50 Italian SIG members loved the information that was presented in "Italian Genealogy: Records & Resources in Italy." For those who did not get a handout in the morning session, one is available in "Members Only" > "Meeting Handouts. 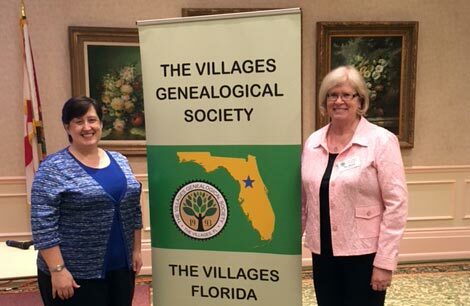 Crista Cowan returned to The Villages and over 550 seats were filled by members during three sessions of lectures and demonstrations on using Ancestry.com. Getting the most from Ancestry.com and many tips and tricks on using your family tree on the ancestry.com website were presented. "Using DNA to Build Your Family Tree" seemed to generate the most questions from attendees. The morning began with a very crowded Brick Wall SIG meeting. You could tell this would be a well attended meeting and it was with 400+ members present. Our guest speaker was Drew Smith. He presented "Organizing Your Genealogy Files and Correspondence." During the meeting, Past President Pat Rand was presented an award for her leadership for the US-Mexican War Preservation Project from the National Park Service. Pat spoke about this project, see more information below. Past President Betty MacDuff notified the membership that she was moving from The Villages. President Adams presented Betty with a Certificate of Appreciation for her six years as president, 2006-2011, and her 17 year membership with the Society.